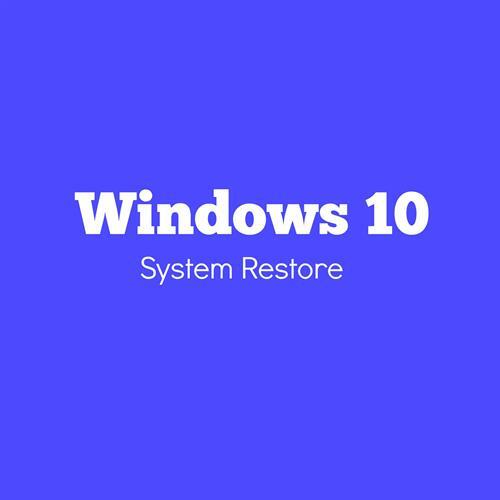 Windows 10 System Restore can save your system from critical system issues. It can bring back functional state of the Windows without having to touch your personal files and data on the drives. It can help you to choose from the states that helps run Windows if the programs stop functioning. Learn how to set System Restore point and how to perform your first system restore. Windows 10 offers the system protection feature offered by previous versions of Windows. It can seriously save your time to reinstall or reformat the system, in case if you lose some critical functionality of the Windows. System restore feature is useful when you have some issues like driver becoming unusable, registry entry missing etc. These small issues can cause your system to be unusable, and in such cases a simple restore to the previous restore point can bring everything back to normal. System Restore is Windows application that allows the user to revert the system settings to the previously saved state. This saved state could be the one that is based on last successful saved state. It is also possible to fix a system restore date with the help of external application. However, whenever Windows installs another program or have registry changes, it saves that state into system restore. This way you get to choose between the system state at various point of time within month or year. Using system restore does not affect the personal data stored on other drives. Is it better than backup? Absolutely not. Backups are made for the personal data storage whereas the system restore is meant for the settings to be restored for the core system changes. So both are going to serve different purposes. Think of system restore as having backup of system settings and system files, so any corruption of issues with system can be reverted to the old working state. In case of backup, we are simply copying the data files and not the operating system functionality itself. You should never stop taking backups, just because you have set system restore points. Think of system restore point as temporary solution only meant for the system changes. You should definitely take data backup from time to time to protect your system. In order to create restore point you need to enable system protection for the drives. Follow the steps below to enable the system protection and to create system restore point. 1. Go to control panel and click on recovery option. 2. Click on configure system restore link. 3. If UAC is enabled, allow the message to configure. 4. In the system properties dialog, make sure system protection is enabled. 5. Turn on system protection if it is disabled. 6. Click on 'Create system restore point" button. 7. Enter the name for "System restore" point dialog. 8. If the dialog says it successfully created system restore point, close the dialog. These are the steps that allows you to create a system restore on your Windows 10. You can also use third party applications to do this. However, doing this on your own is much better than using external program. Once you have setup the restore point, then you can come back later when you wish to bring back the system to the state where it was more responsive or had less system issues. To do the system restore for the specific point, follow the steps below. 1. Open control panel and click on recovery option. 2, Click on open system restore. 3. It'll ask you for the UAC permission. Click Yes. 4. Select the system restore point which you want to revert to. 5. Scan the programs for the affected issue. 6. If the scan contains the issues then proceed to next step. 7. Click on next to start recovery process. 8. System restart will happen and then recovery starts. After the restart system goes back to the state which you selected from the system restore point. Some affected programs get recovered most of the time, or you may have to reinstall them. And by doing this you get your system restored. Do note that whenever you install drivers and programs that are critical for the core Windows 10 functionality, just make sure to have system restore point. This way you can restore to that point without having to lose the System drivers and programs. We have used the System Restore feature on Windows XP and Windows 7. While it used to be an easy procedure to restore the system on Windows XP, I have a feeling that it is a bit complicated and has much chance of going wrong on Windows 7. Is it the same case with Windows 10 as well? I am always a bit sceptical about restoring the system settings. If the Windows 10 is from an upgraded one, then you may notice a few quirks. If the install is fresh then you may find the system restore and hibernation working smoothly. If you take regular backup using external drive then I don't think you need this feature though.